Please be aware that work is now under way at the former visitor centre, which means that the site and some of the adjacent paths will be closed, for the safety of our visitors whilst we restore the forest. 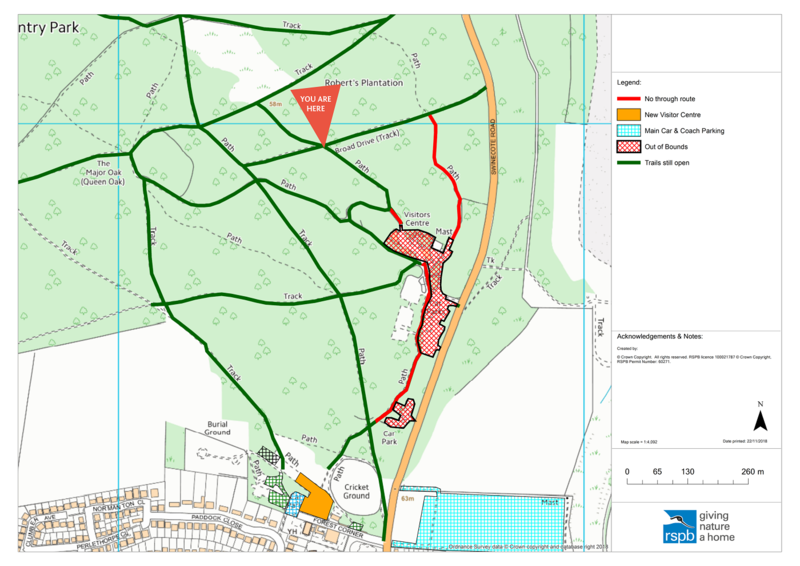 The area will be fenced off for the duration of the works and some paths will be affected. Please take a look at the map here to see where alternative routes are. There will also be signage on site to help visitors avoid the area. We have had to close the path between the old play area and former visitor centre due to the amount of construction traffic using this area. The safety of all forest users is our priority. There are alternative routes, so hopefully, visitors won’t be caused too much inconvenience. We apologise for any disruption – we’ve worked hard to try and keep it to a minimum, and hope you’ll understand the need for this work to be carried out. Please see our earlier post, Restoring the Forest to find out just what we are doing here, why, and how we are working to create four new acres of forest to enjoy! Map showing the path closures during the restoration works.